Getting your boat into the water will be one of the most memorable yet precarious moments of your entire boat living experience if your boat is not already in the water. It will be a nerve jangling, yet exciting time, as you’ll feel a mixture of trepidation and fear combined with excitement that your boat is finally going to be where she belongs, i.e. in the water, yet at the same time, there is always that worry at the back of your mind that something is going to go wrong. 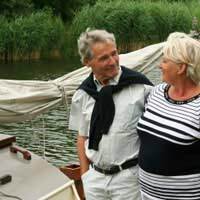 Unlike the procedure of reversing a vehicle attached to a trailer containing your boat down a ramp and into the water, the chances are that if you’re buying a boat to live on, it will be too big a proposition for that kind of method and the chances are that you’ll need to employ the services of a specialist boatyard to get your boat into the water. The procedures for doing this will obviously differ between the various types of boats and the areas of water you’re putting them into. For example, putting a narrowboat into a canal is going to be very different from launching a midsize to large yacht into the sea. The fact is that is that you’ll need the right kind of equipment and expertise which only a boatyard or marina facility can provide. Once again, this will vary but yachts can be launched by being winched by a crane and lowered onto a sloping slipway from which they’ll slowly travel down before reaching the water. Others might rely on cranes to simply set them down in the water. With boats on canals and rivers, they’ll often be put into the water using a land-based crane which will use a combination of heavy steel chains and clamps strategically placed around areas of the vessel so that when it’s lifted, it remains stable and horizontal from where the crane will then manoeuvre it over the water and gently lower it into the water from that point much the same way as with a yacht. Narrowboats can often be found placed on specially designed tilted platform ramps (like very strong planks) which are placed at a level on the land, but literally only a foot or so above that of the water line, from which they can literally be pushed into the water. Obviously, getting any large boat, whatever its type, into and out of the water involves specialist equipment and specialist knowledge and expertise which is why you’d need to employ the services of a professional boatyard or marina unless your boat is small enough to be put into the water using the more conventional recreational approach of having a boat on a trailer and using a vehicle to reverse it down a ramp.